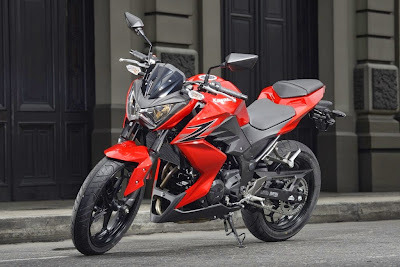 Bajaj today launched the Kawasaki Z250 and the ER-6n in India. The Z250 marks a new chapter for the Japanese manufacturer, as it is the most affordable product in the lineup priced at INR 2.99 lakhs, ex-Showroom, New Delhi. The Z250 borrows its styling from the larger and more expensive Z800. Based on a tube diamond steel frame, the motorcycle measures 2,010 mm in length, 750 mm in width and 1,020 mm in height. It has a wheelbase of 1,400 mm and a ground clearance of 145 mm. The Z250 weighs 168 kg and has a 17-liter fuel tank. The street-fighter is assembled with a 37 mm telescopic fork at the front and a Bottom-Link Uni-Trak with gas-charged shock and 5-way adjustable preload at the rear. Even more impressive are the dual semi-floating 300 mm petal discs at the front and the 220 mm single petal disc at the rear. However, the highlight of the Z250 is its liquid-cooled, four-stroke, parallel-twin, 249 cc 8v DOHC engine. This fuel-injected unit is paired to a 6-speed transmission, and sends out 32 PS (31.54 hp) at 11,000 rpm and 21 Nm of torque at 10,000 rpm. Kawasaki says that the engine is fitted with a sleeveless, plated, die-cast aluminium cylinder and lightweight coated pistons to ensure reliability. Cyclone Hudhud blasted India's eastern seaboard on Sunday with gusts of up to 195 kilometres an hour (over 120 mph), uprooting trees, damaging buildings and killing at least three people despite a major evacuation effort. The port city of Visakhapatnam, home to two million people and a major naval base, was hammered as the cyclone made landfall, unleashing the huge destructive force it had sucked up from the warm waters of the Bay of Bengal. Upended trees and wreckage were strewn across Visakhapatnam, known to locals as Vizag. Most people heeded warnings to take refuge, but three who ventured out were killed, officials said. The chief minister of Andhra Pradesh, the state that bore the brunt of Hudhud's onslaught, said the extent of damage would only become known after the storm abates. "We are unable to ascertain the situation. Seventy percent of communication has totally collapsed ... this is the biggest calamity," N. Chandrababa Naidu told Headlines Today television. "We are asking people not to come out of their houses," Naidu said, adding that damage assessment would start on Monday. "We are mobilising men and material immediately." Prime Minister Narendra Modi called Naidu and promised "all possible assistance in relief and rescue operations", his central government said in a statement. The low toll reported so far followed an operation to evacuate more than 150,000 people to minimise the risk to life from Hudhud - similar in size and power to cyclone Phailin that struck the area exactly a year ago. After a lull as the eye of the storm passed over the city, winds regained massive potency. Forecasters warned Hudhud would blow strongly for several hours more, before wind speeds halve in the evening. "Reverse windflow will be experienced by the city, which will again have a very great damage potential," L.S. Rathore, director-general of the state India Meteorological Department (IMD), told reporters in New Delhi. The IMD forecast a storm surge of 1-2 metres above high tide that could result in flooding of low-lying coastal areas around Visakhapatnam, Vijayanagaram and Srikakulam. A Reuters reporter in Vizag said the storm had smashed his hotel's windows and flooded the ground floor. It was difficult even to open the door of his room, he said, as wind rushing through the corridors drove it shut again. "I never imagined that a cyclone could be so dangerous and devastating," said one businessman who was staying in the hotel. "The noise it is making would terrify anyone." An operations centre in state capital Hyderabad was inundated with calls from people seeking help, including 350 students stranded in a building with no food or water, said K. Hymavathi, a senior disaster management official. Vizag port suspended operations on Saturday night, with its head saying that 17 ships which had been in the harbour were moving offshore where they would be less at risk from high seas. The city airport was closed and train services suspended. The IMD rated Hudhud as a very severe cyclonic storm that could pack gusts of 195 km/h and dump more than 24.5 cm (10 inches) of rain. The cyclone was strong enough to have a "high humanitarian impact" on nearly 11 million people, the Global Disaster Alert and Coordination System (GDACS), run by the United Nations and the European Commission, said. The evacuation effort was comparable to one preceding Cyclone Phailin, credited with minimising fatalities to 53. When a huge storm hit the same area 15 years ago, 10,000 people died. 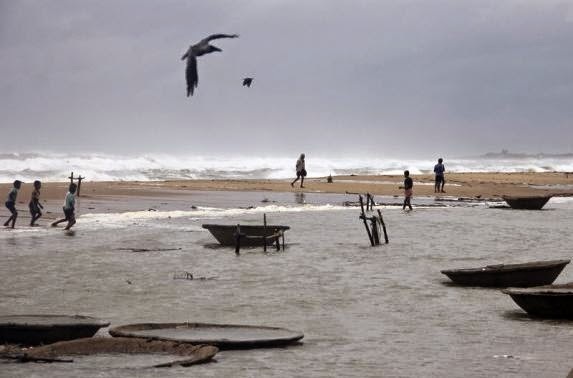 Hudhud was likely to batter a 200-300 km stretch of coastline before losing force as it moves inland, forecasters said. According to the IMD, peak wind speeds will drop to 60 km/h by Monday afternoon. Hudhud is expected to continue to dump heavy rains in northern and northeastern India and, eventually, snow when it reaches the Himalayan mountains.